These commentators are used by government departments to scour the internet for bad news - and then negate it. Chinese leaders seem aware that the internet - the only public forum where views can be freely expressed - needs close attention. That policy was extended to the internet, and many websites are blocked by a system sometimes dubbed the "great firewall of China". A document released by the public security bureau in the city of Jiaozuo in Henan province boasts of the success of this approach. It retells the story of one disgruntled citizen who posted an unfavourable comment about the police on a website after being punished for a traffic offence. One of the bureau's internet commentators reported this posting to the authorities within 10 minutes of it going up. The bureau then began to spin, using more than 120 people to post their own comments that neatly shifted the debate. "Twenty minutes later, most postings supported the police - in fact many internet users began to condemn the original commentator," said the report. These internet opinion-formers obviously need to show loyalty and support to the authorities. They also need other skills, as a document from the hygiene department in the city of Nanning in Guangxi province makes clear. "[They] need to possess relatively good political and professional qualities, and have a pioneering and enterprising spirit," the document said. They also need to be able to react quickly, it went on. The practice of hiring these commentators was started a couple of years ago by local governments which found it hard to control public opinion. They could not rely on Beijing to monitor and block every single piece of news about their localities, so they came up with their own solution. Internet commentators have now become widespread, according to experts. Some estimate that there are now tens of thousands of them. 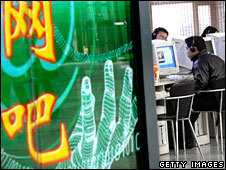 There are also reports that special centres have been set up to train China's new army of internet spin doctors. Their job is more important than it would be elsewhere in the world. "Politically, the internet is more important in China than in other societies because it's the only public space where people can express themselves," said Professor Xiao. That is a point that has not escaped Chinese President Hu Jintao. When he chatted online in an internet forum earlier this year he said it was important to set up "a new pattern of media guidance" for the internet. China's teams of state-sponsored commentators have a lot of work ahead of them.